This Rolleiflex 104300 Standard Right Angle Flash Bracket is NOS. Favorites List! Feel free to ask! Material: Aluminium. 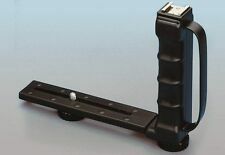 Kood Folding Flash/Microphone Bracket Grip Bar. The Kood folding flash/microphone bracket can be adjusted to 3 different angles. The grip has a supporting strap. Height 140mm. Grip with hand strap. Mounting screw with 1/4“ thread and tripod bush. Height of grip: approx. 13.5 cm (5.3 in.). Frio Cold Shoe. 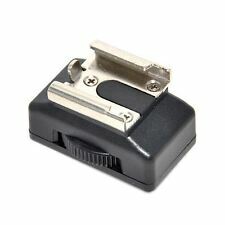 Universal flash mount adapter bracket. 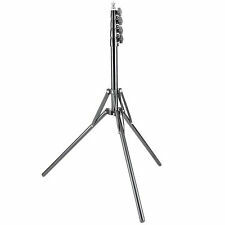 Tripod or lighting stand. FRIO Cold Shoe. Designed to make your shoot quick, safe and secure! • Patent-pending dual lock technology for secure mounts. 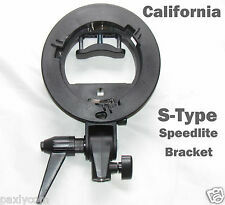 This Speedlite Adapter Bracket is quick and easy to set-up. I. All you need to do is simply, mount your flash, mount the bracket to a light stand, and add your then mount your modifier of choice, and then you’re ready to go. Bracket works great for speedlight and LED lights. This bracket is great for Macro photography. Bracket can be easily converted to a C shaped bracket with two adjustable flash shoes. Two speedlights can be attached onto this bracket. 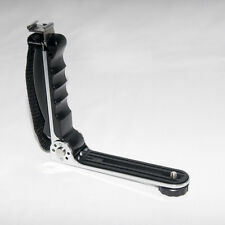 "Bounce Shoe" & "Synchro Shoe" Can also be mounted on the bracket. ( Left Hand Grip ). Open box item. What you see in the pictures is exactly what you will be receiving. Suitable for most DV / mini DV camcorder / DC / SLR camreas standard 1/4 "tripod socket. 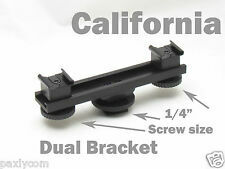 This is a C-Shape flash bracket designed for mini camcorders and DSLR. For hot shoe flash and flash trigger (not including Sony and Minolta flash hot shoe flashes due to different socket). This Smith Victor SV No. 526 Right Angle Bracket Handle is NOS. Favorites List! STURDY AND DURABLE- Max load: 3.5lbs.It is lightweight but made of sturdy Aluminum Alloy and precise CNC process anodized aluminum materials, sturdy and durable,it won't be easy to suffer corrosion or breakage. Flash bar can be mounted to a tripod for stability. Height (From base platform to flash shoe): 210mm. Rest of World. Mounting screw with 1/4“ thread and tripod bush. Feel free to ask! SNODO UNIVERSALE A SFERA PER STATIVI E FLASH 360° SUPPORTO STAFFA VITE 1/4 "
Lo snodo è orientabile in ogni posizione ed è completo di zoccolo universale regolabile per l'attacco del flash. SNODO PROFESSIONALE PORTA FLASH E OMBRELLO CON SLITTA. La parte inferiore dello snodo ha filetto 3/8. The Custom Brackets Folding-T Flash Bracket is a taller bracket for larger cameras to be accessorized with an off-camera flash. The Folding-T can be mounted to either the left or right side of the camera depending on the user's comfort. It holds a flash 11" (28cm) above the lens. Bracket can be easily converted to a C shaped bracket with two adjustable flash shoes. Bracket works great for speedlight and LED lights. This bracket is great for Macro photography. From middle of ring to mounting screw can extend from 70mm (using one piece)to 140mm (using both pieces). It’s lightweight and made of sturdy aluminum. The mount has a 1/4"-20 threaded hole for mounting it on tripod or light stand. The shoes feature a backstop for secure mounting. Three standard flash hot shoe mounts. 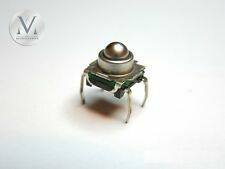 Fabricant: Keystone Electronics. Taille de la cellule de batterie: 18650. Type: Battery Holder. Nombre de batteries: 2 Battery. Sous-catégorie: Battery. Flashgun adapter can be attached to the light stand, insert the flash unit and umbrella, then adjust the mount so it is at an optimum angle for getting great photographic results. Flash Stand Bracket Umbrella Holder D type. I have no way of testing this item, so sold AS IS. a collectable Kodak accessory. Signs of normal use. With this Hot Shoe Extension, you can have more lights used with one cam, simply insert the item to the hot shoe position, and then put the LED lights in. Hot Shoe Extension Bar x 1. Material: Aluminum alloy. 1 x Boitier prépercé pour DNA 89x47x25mm. Kit DNA 25 D Evolv avec composants de qualité. 1 x DNA 25 D Evolv. 1 x Support pour module DNA 25. Boitier prépercé et taraudé pour recevoir un connecteur 510 Fatdaddyvapes 22mm. Very sturdy construction and in good condition with a few signs of previous use (see photos). In addition to the shoe mount, a 1/4"-20 thread is also available for attaching the bracket to a tripod, rig, or other bracket featuring a 1/4"-20-threaded mount. Provides Three Shoe Mounts. 3x wall plugs and 4 screws. All BFPO locations. THIS IS A USED HASSELBLAD 45039 ADJUSTABLE FLASH HOLDER IN GOOD WORKING CONDITION. 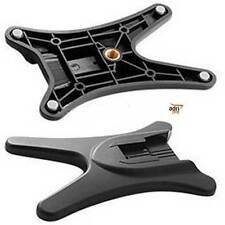 2 x kaavie type B swival hot shoe flash bracket holders for light stand. Condition is New. Dispatched with Royal Mail 2nd Class. It is held in the right hand where the handle flash is mounted. It is made of plastic and aluminum. The flash has to be used with a PC sync cord. The grip is in excellent condition. Made in Japan. 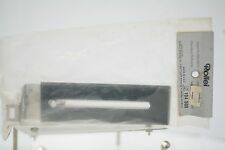 KODAK FLASHOLDER CAMERA-BRACKET , 14cm LONG , BOXED . Grab Box Of Different Flash Brackets Parts. AS-IS.